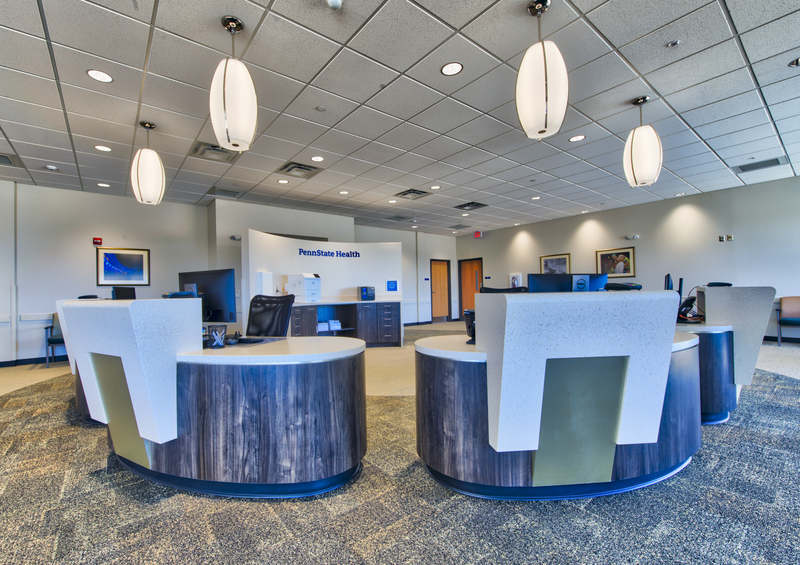 The new, innovative Penn State Medical Group practice site in Mechanicsburg uses technology and "lean" design principles to improve patient privacy and reduce wait times. A new Penn State Medical Group physician practice in Cumberland County will improve access to primary care health services for people in the Mechanicsburg and Carlisle areas. The new outpatient practice features innovative design elements and processes intended to streamline the patient experience. The practice site is located in Silver Spring Township along Route 114, near Interstate 81. Four family medicine and internal medicine providers and eleven staff work at the office. The new building features 9,000 square feet of clinical space, including 14 exam rooms, staff work areas, patient waiting areas and support space. The building includes an additional 4,000 square feet of undeveloped space which is expected to eventually house up to 14 more exam rooms. The practice site is equipped with a real-time location system – technology that uses ceiling sensors, personal badges and mapping software to manage the location of providers, staff and patients throughout the practice. The system is aimed at improving staff efficiency, resulting in reduced wait time for patients. The building design is based on “lean” principles, and will allow for the patient&apos;s entire visit – from intake to check out – to occur in the same room, allowing for smoother transitions and greater privacy than in a traditional practice setting. The operating principles and technology being employed at the Mechanicsburg practice may eventually be expanded to other Penn State Medical Group locations. Patients seen at the practice who require additional diagnostic or therapeutic services, such as lab work or physical therapy, or those who need referrals to medical or surgical specialty care, will be able to access these services at the nearby Camp Hill practice site, located six miles away.